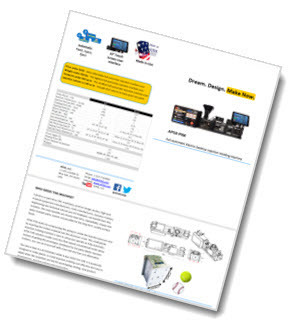 The Desktop Plastic Injection Molding Machine was created to address a specific need for designers, R&D professionals, educators, hobbyists, and low volume specialty manufacturers. This need is not being met by existing small injection machine designs, existing molders, or 3D prototype companies. While most small injection machines meet the need for an injection press that is portable and easy to use for one rough part at a time in a small shop or small facility, none have the repeatability and precision necessary to work with real-world materials or real-world designs. With the Desktop Plastic Injection Molding Machine, we set out from the beginning to create a new type of desktop injection machine – a design that combined all the attractive features of a desktop injection machine with the performance of a large size full automatic injection machine. A real injection machine without the typical compromises of desktop injection presses. 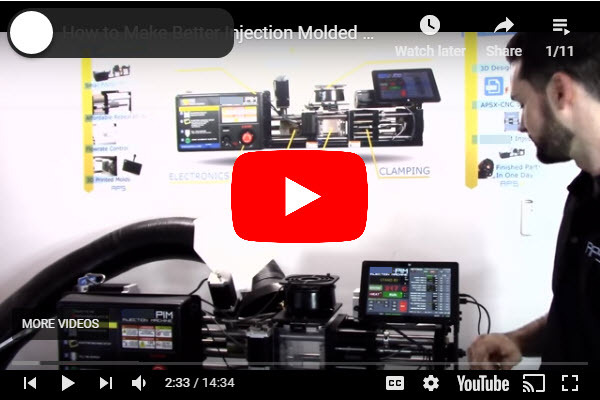 The Desktop Plastic Injection Molding Machine can be moved onto nearly any workbench and requires only basic 120VAC wall outlet to operate, but has the ability to make parts much more than a rough draft prototype plastic part. Smaller doesn't mean less capable. The Desktop Plastic Injection Molding Machine uses the latest available technology for precision and repeatability. State of the art precision sensors combined with direct-drive ballscrews and a precision microstepping drive system that offers superior performance compared to typical desktop injection presses built. A precise movement sensor offers the accuracy and sensitivity needed for controlling the injection amount while adjusting the plastic flowrate through the nozzle valve. This happens without restricting material choices. Any plastic including, but not limited to, ABS, Polypropylene (PP), Polystyrene (PS), Polyethylene (PE), Polycarbonate (PC), thermoplastic polyolefin (TPO) can be used with MFR (ASTM D1238) > 10 g/10min or MFR (ISO 1183) > 30 g/10min and viscosity value less than 1500 poise. The ability to add more horizontal length like 6 to 12 inches and different ratio gearbox selection to increase the clamp force as needed, gives the Desktop Plastic Injection Molding Machine much more capability than any other small injection machines. Create your own molds using the Roland Milling Machines, and you can use our standard mold blank to cut in the core and cavity to make mold making fast and simple. The Desktop Injection Molder gives you the ability to print the molds in a high end 3D printer. Just use our standard 3D printed insert molds, add your model core and cavity and print, this gives you much more flexibility, speed, and cost reduction than any other small injection machine. *Surface finish will not be as good as a mold milled by a cnc mahcine, surface finish on finished part will reflect the surface finish of the 3d printed mold. Most small injection machines are more style than substance, with designs that are expensive and difficult to maintain without an experienced technician. The Desktop Plastic Injection Molding Machine is an easy-to-maintain and affordable to run desktop injection machine in both R&D labs and small manufacturing shops. Product Development Inc has been selling and supporting product development equipment since 2002. We have won multiple awards for both sales and service. Our company started as a design firm/model shop using CAD and 3D prototyping equipment like 3d printers and cnc machines to design and build products for our customers. We made a transition over 12 years ago to focus on selling equipment to engineers and others who create. We sell Roland equipment to all companies, individuals, schools and universities. We ask that you please consider us when making a purchasing decision, we have the knowledge and experience to make you successful. See who trusted us to help them find a solution for their needs. We have 11 videos that explain how the desktop injection molder works and you can see it in action. Want to learn more about the Desktop Plastic Injection Molding Machine? Download our Plastic Injection Guide. 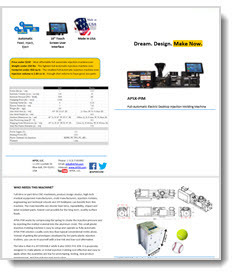 Download the Desktop Plastic Injection Molding Machine Brochure. Is 5 tons clamp force enough for my part to be molded? Typically conventional injection molding machines are big and have high amount of clamp forces such as 30 tons or more. The way they operate is different than the Desktop Plastic Injection Molding Machine. They usually use hydraulic power to create injection pressure and clamp force. That method creates high forces on both sides of the equation (injection and clamping) and stay in equilibrium where the molds are kept clamped and close. With the Desktop Plastic Injection Molding Machine, only 90% of the part volume is injected in high injection pressure when there is not much clamp force needed. The rest of the 10% is being injected or packed at holding pressure which is much lower than injection pressure. The holding pressure is not a problem for 5 tons clamp force because it is very low. Therefore, 5 tons for the Desktop Plastic Injection Molding Machine is much higher than that comparing to a conventional injection molding machine's clamp force. The part area that is parallel to the mold opening direction and holding pressure will dictate the required clamp force. Example: The part area that is parallel to mold opening direction is 2 sq-inches The Holding Pressure: 1000 psi 2 x 1000 = 2000 LBS This is the force that will try to separate the mold. Since the Desktop Plastic Injection Molding Machine has 10,000 LBS of max clamping force, this would not be a problem for most designs. What are the suggested plastic material specs for the best injection performance? We suggest using a standard size (0.125" diameter) virgin plastic pellets. As a general rule, the machine will perform "better" with high melt flow rate (MFR) materials. It all depends on the mold design. It has to be designed for 5000 PSI injection pressure and 5 tons clamp force. Typically we have been using materials with 10 MFR and higher. Any plastic including but not limited to ABS, Polypropylene (PP), Polystyrene (PS), Polyethylene (PE), Polycarbonate (PC), thermoplastic polyolefin (TPO) can be used with MFR (ASTM D1238) > 10 g/10min or MFR (ISO 1183) > 30 g/10min and viscosity value less than 1500 poise. ABS has been preferred by injection molders because they want to make maximum number of parts in a given time and use their expensive injection molding machines continuously. ABS is perfect for that purpose. We suggest that you always start small and test the market then go to mass (plus million parts a year) production. PP and PE materials are perfect choices for the initial market test sometimes even as the permanent product material. They are really forgiving for the mold imperfections and more durable than ABS against climate effects like heat and cold. For example, the surface cracks on a car interior or outdoor product made from ABS after several years of usage exposed to thawing temperatures and to freezing winter cold. What kind of ventilation system do I need? A good quality portable or permanent system has to be installed due to fumes released from the hot plastics. ABS, Delrin and Nylon are typically the most toxic. If you are indoors and run the machine all the time, we suggest using a portable ventilation system such as our BOFA line of Air Filtration Systems. How does the ejector mechanism of a mold work? There is a center push ejection rod just behind the moving plate. There has to be ejector plate and pins designed specific to the part being injected. The ejector plate adds to the total thickness of the mold and consumes the volume from the part size. It provides the convenience of making parts hands off and continuously in multi-mode on the Desktop Plastic Injection Molding Machine. The ejector system should be optimized so that the part is ejected 100% of the time when a cycle is completed. Otherwise, there may be some damages on the mold or on the machine parts. We always suggest getting used to machine in single shot mode before moving into auto multi-shot mode. An economical feasibility study can be done considering all possible scenarios. If there is manpower utilized in the facility that can take the part out of the mold once it is completed once every minute, it may make more sense in terms of cost to avoid ejector system design and maintenance. What are the blank mold sizes and are they standard for the Desktop Plastic Injection Molding Machine? The mold size has to be a certain height and length. The standard size is 6" high and 4.8" long. The depth of the mold depends on the part size but has to be 3" max. The blanks can be purchased from our website. If you prefer to design your own molds, the 3D drawing files on our website can also be used. We certainly suggest Aluminum (6061 or QC-10) mold material due to its fast air-cooling ability. What kind of mold do we have to design for the Desktop Plastic Injection Molding Machine? The Desktop Plastic Injection Molding Machine provides 5000 PSI injection pressure and 5 tons clamp force. Given that, a mold maker should design the mold according to these machine specs. All of the features such as draft angle, wall thickness, one or multi-cavity mold decisions have to be made considering the injection molding machine being used. All parts are unique and so all molds are too. There is a scientific relationship between the part size and the pressures applied to the mold. The initial injection pressure does not create high pressure inside the mold but the flow rate can. Once the machine drops to holding pressure about 90% of the part volume is injected into the mold, the mold gets pressurized. On the other end of the machine, clamp force holds the mold closed so that there is no flashing on the part. The rule of thumb is that Holding Pressure X Footprint Area of the Part on the mold face < Clamp Force. The footprint area is defined as the largest projected area of the part on the vertical face of the mold perpendicular to plastic flow. What is the maximum shot size that the Desktop Plastic Injection Molding Machine can perform? 1.83 cu-in or 30 cu-cm is an achievable size although it may vary due to mold design. Typically it corresponds to a max 30-40 gr in part weight since each plastic density value are different from each other. There is no frequent maintenance activities involved. However, be sure that the hopper has material in it and hopper pipe is cleared from any obstructions from the previous injection sessions. Since there is no water or oil connection so the maintenance is minimal. The shafts may need an extra lubrication after being used for a long time (approximately 500 hours) to allow the shaft bushings to slide with less friction. We recommend using synthetic 10W-30 oil, applying an even coating on the shafts. Is the mold heated and temperature controlled? One side of the mold touches to the fixed platen which is getting heated through the barrel. So the entire mold gets hot unless there is no cooling system. The desired mold temperature is set under settings and is controlled via a temperature sensor and the fan. Fan controls the temperature on the mold between 60 Celsius and 100 Celsius. External heater/chiller units can be used if this does not meet the requirements. Can this machine run 24/7? Yes. However, keep in mind that even if you have a million dollar full automatic giant machine, injection molding machines should not be left unattended. Remember you have very hot and pressurized plastic material inside the machine. As long as you have an assigned worker responsible for the machine, you can maximize the run time. The current hopper size is 10-12 lbs depending on the material. If desired, an automatic feeder can be installed. What are the temperature and humidity requirements for the machine to run? First of all never use the machine in a hot and humid outdoor environment. Humidity would affect the plastic polymers and you may have to use a dryer for that. We suggest you to follow the guidelines of the manufacturer of material being injected. In terms of the machine itself, the typical operating temperature range is 40-95F (5-35C).